Flipkart is live with an exciting app referral offer. 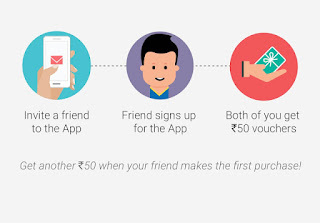 Now just invite your friends to install Flipkart Android App and get Rs.50 in your Flipkart account. Also you will get another Rs.50 when your friend makes purchase within 30 days. You can invite maximum of 20 friends. So overall you can earn up to a maximum amount of Rs. 2000 per Flipkart account. Below is a step by step process to get Rs.2000 in your Flipkart account. Also we have added a trick to get unlimited Flipkart app invite cash. Download Flipkart Android App from here. Install it in your Android Smartphone. Now just create a new account by verifying your phone number or login with existing account. Now click on the top right side corner button and then select "Invite And Earn" from menu. Enter refer code "ynrauu" in order to receive Rs. 50 gift voucher. Once you've entered the above code, you can see Rs.50 gift voucher in "My Earnings" tab in Flipkart app. How Much Can Be Earned With Flipkart App Share? You can earn a maximum amount of Rs 1000 e-gift voucher by inviting 20 members (referral limit). You can avail the installation reward + referring rewards as EGV. You can purchase any product with the voucher or get an instant discount if the product price is higher than the gift voucher. You can get only 20 friends vouchers. You can earn maximum 2000, rs 1000 for registration and 1000 of their first shopping. Once you have installed the app on your Smartphone; just copy your referral code and then uninstall app from your phone. Reboot your Smartphone, paste your referral link in your browser to install Flipkart app again on your Smartphone. Create a new account by verifying new mobile number, enter your refer code and that's it. You both will get Rs.50 gift voucher. Keep on entering until you get Rs. 1000. So this was cool Flipkart app referral/invite offer to earn real cash or gift voucher. If you've any query then feel free to leave a comment below in the comment section.